This dill and white cheddar sourdough bread combines two of my favorite flavors, herby fresh dill, and nutty, creamy white cheddar. 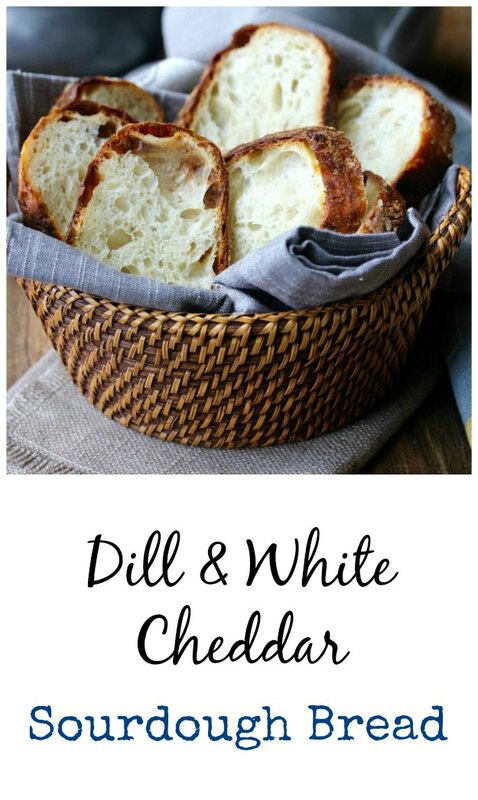 This dill and white cheddar bread is such a savory treat. We loved slicing and eating it without any adornment on the day it was baked. It's also excellent toasted and buttered the next day. It's also fabulous served with soup. One of my favorite herbs is fresh dill. I love it in eggs, with salmon and cream cheese on bagels, in potato salad, and in salad dressings. I'm also such a huge fan of adding dill to bread. I also love cheese. Luuurve cheese.... and when cheese and dill get married and live in a loaf of sourdough bread, it makes me "jump-up-and-down-I-can't-believe-how-good-this-is" happy. Pull-apart Dill Bread (I love the look of the dill in this loaf). Cottage Cheese, Dill, and Caramelized Shallot Bread. Note #1: There are three tablespoons of chopped fresh dill in this loaf. I wish you could see the little flecks of dill in there (I'll have to get closer next time). If you prefer a more "dilly" taste, as well as for the dill to be more visible, feel free to double that amount. The white cheddar cheese in this bread is shredded rather than cubed, so you can't really visibly detect it. Instead, you get the taste of melty cheese in every bite. This bread is delicious. Enjoy it unadorned the day the bread is made. It's also out of this world dipped in marinara sauce or olive oil and balsamic. It also makes fabulous BLTs, and believe it or not, grilled cheese. 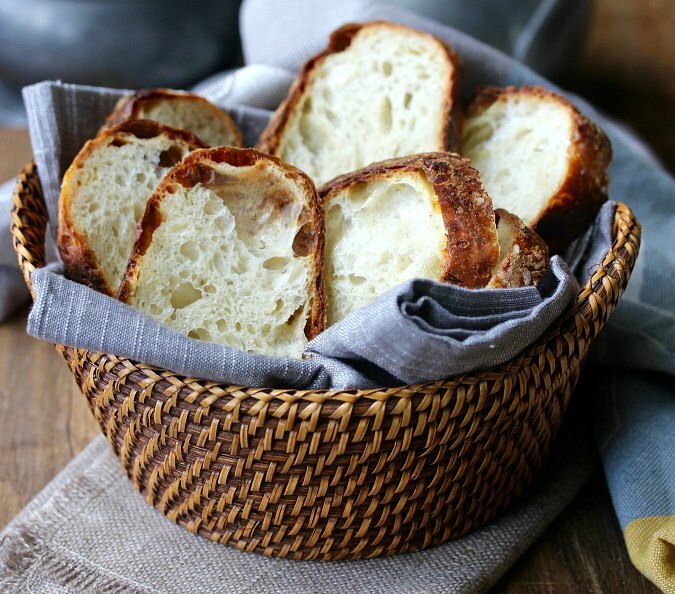 While it takes two days to make, you will be rewarded with an amazing sourdough bread. Note #2: For the cheese, I used Cabot Alpine Cheddar cheese. It has a nice grainy texture, melts perfectly into the crumb, and reminds me of a sharp Gruyère. If you can't find it, any sharp white cheddar will do, or if you want to really splurge, use Gruyère with a tablespoon or two of Parmigiano-Reggiano mixed in. Note (#3) on timing: Before making this bread, be sure to get your starter nice and bubbly. Once your starter is ready, you will need two days to make this bread. "Two days????" you ask! Yes, but most of the time is inactive. 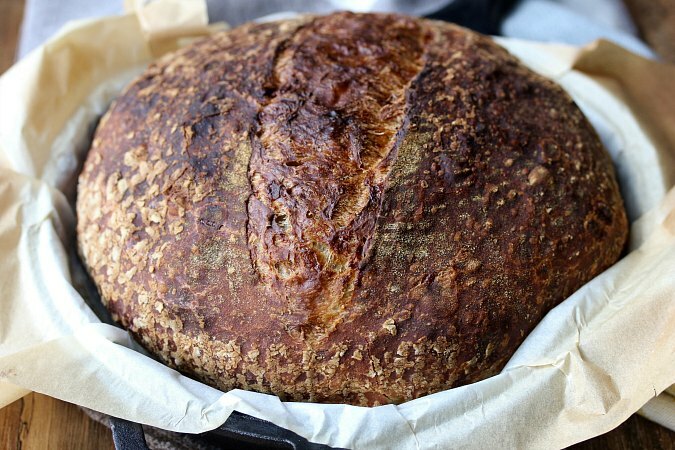 With patience, you will be rewarded with one of the most wonderful sourdough loaves. Note (#4) on the recipe: This recipe was inspired by one of my new favorite sourdough cookbooks, Artisan Sourdough Made Simple. It's a great beginner's guide to making sourdough bread. Did you know that June 4th is National Cheese Day? Pretty much the most important day of the year as far as food holidays go. After the recipe, be sure to check out over a dozen food bloggers' amazing recipes using cheese, hosted by Camilla, of Culinary Adventures with Camilla. Whisk the starter and water together in a large bowl or dough rising bucket. With your hand or a dough whisk, mix the flour and salt until combined. Cover with a damp towel or plastic wrap and let sit for an hour. Add the dill and cheese to the dough by folding and gently kneading it in. Cover the bowl and let it rest for 30 minutes. Do four stretch-and-folds, 15 minutes apart, covering the dough with a damp towel or plastic wrap between each "stretch-and-fold." Cover the dough and let it rise for for about 8 to 10 hours at room temperature, until doubles in size. Gently scrape the dough out onto a lightly floured work surface. Shape it into a boule without deflating the dough, and let it rest for about 10 minutes, seam side down. Line a 9 inch bowl with a tea towel and generously sprinkle it with a 50/50 mixture of wheat and rice flour. Tighten up the dough by gently scooting it across the work surface to increase surface tension. Place the dough, seam side up, into the towel lined bowl. Cover and place into the refrigerator for 8 to 12 hours. Heat your oven to 500 degrees F with a covered Dutch oven on the middle rack. Remove the shaped loaf from the refrigerator while the oven is heating. Place the parchment over the dough and place a place over the parchment. Invert the bowl and remove the bowl and tea towel. Score the dough in the middle. Carefully move the Dutch oven out of the oven, and transfer the dough, using the parchment as a sling, to the Dutch oven. Cover and return the pan to the center rack of the oven. Reduce the heat to 450 degrees F and bake the loaf for 20 minutes, covered. Remove the pan from the oven, uncover, and move the loaf to a baking sheet. Return the loaf to the oven, and bake until the interior temperature reaches 210 degrees F and the crust is dark brown. Cool the loaf on a wire rack for at least an hour before slicing. Camilla from Culinary Adventures with Camilla: Cheese, Please! Your breads always have me drooling all over my laptop Karen. Wendy, I know, right?! I need bread-baking lessons from Karen. This, as all of your loaves, Karen, looks just amazing. Thanks for joining me. You guys prop me up! That looks and sounds like such a flavorful loaf of bread! I'm adding it to my to bake list! The texture on this looks amazing! I was soooo happy with it. Oooh, you won't be disappointed. Even dill seeds in the bread would be delicious. Wishing I could reach through the screen for a slice (or three) of this bread! Perfection! Wow, how lovely is this bread, just fabulous! 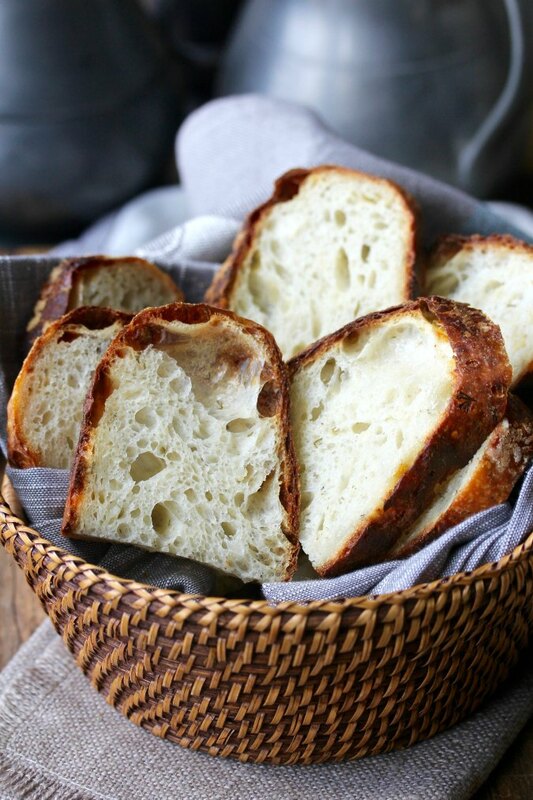 My family loves homemade bread so I am always looking for great recipes, and I love this one! The sourdough starter is perfect. I love the cheese and dill combo! Thanks Eileen. The cheese will make you very happy! Wow this is another amazing loaf, Karen! It looks fabulous and I bet the flavors are wonderful. Be still my heart, dill and cheese together, in a bread? Thanks so much for sharing this over at First Monday Favorites, and torturing me in the process.